Author(s) Robert M. Sherfield Moody, Patricia G.
For First Year Experience, Student Success, and Introduction to College courses. Written specifically for students attending four year programs, it addresses the needs and challenges of today's college students. 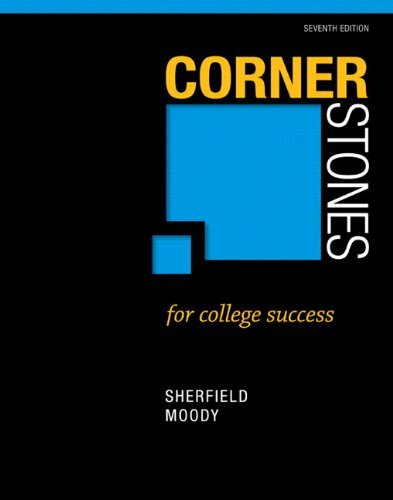 Cornerstones for College Success is known for its' concrete and practical strategies that students can apply to all college classes, the world of work, and life in general, and addresses the "why" of learning and the power of positive change. Offers hallmark coverage of Bloom's taxonomy, SQ3R integration, Information and Financial literacy. Major defining topics include first generation students, adult learners, making successful transitions, and planning for success in the second year and beyond. The ancillary materials are designed to assist instructors in delivering a top-level student success course.